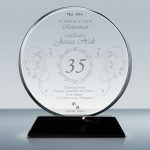 Retirement Plaque - Crystal Circle Award (016)	Overall rating:	5	out of 5 based on 1	reviews. – Image Proofs: Next Business Day. – Normal Order Delivery Time is 7 to 8 days. Express order delivery time is 4 to 5 days. Click Here for more detail. – All products related charges are Included in price, no hidden fees. – Rush shipping and 3D options are available. 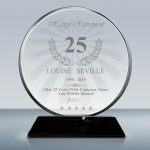 The Crystal Circle Award from our Optic Crystal Award Collection showcases a premium K9 high quality crystal beveled Circle mounted on a clear crystal base. 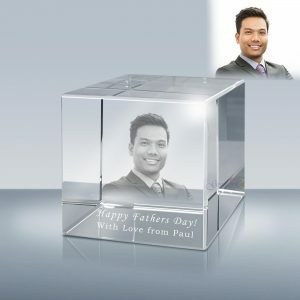 This brilliant and elegant design reflects light in a dazzling display. This award has a spacious engraving space, and is perfect for a message. 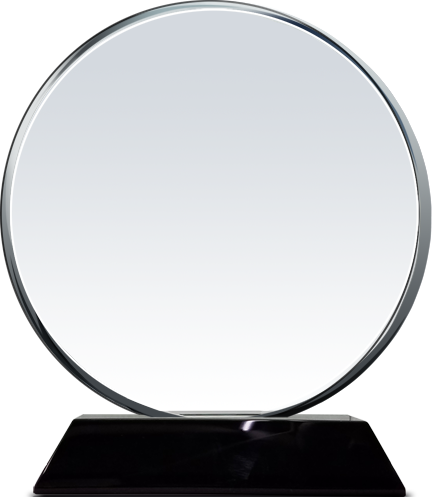 This award is popular as an achievement award, appreciation award, sales and leader award, as well as sponsor awards and management awards. Retirement is the beginning of new phase of life to celebrate. Retirees may not always need more stuff, but almost every retirees appreciate the recognition by colleagues of their contribution and service to the organization, and positive impact to others’ life. 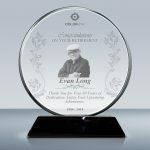 A personalized crystal retirement crystal plaque is one of the thoughtful ways to memorize the moment in retirement ceremony. A classic personalized retirement crystal plaque is a unique gift to retirees and can be cherished for long time. 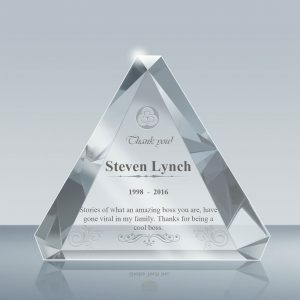 This elegantly designed high quality crystal plaque offers spacious area for good wishes and farewell wording, and also allows retiree’s photo image to be engraved inside of the crystal. 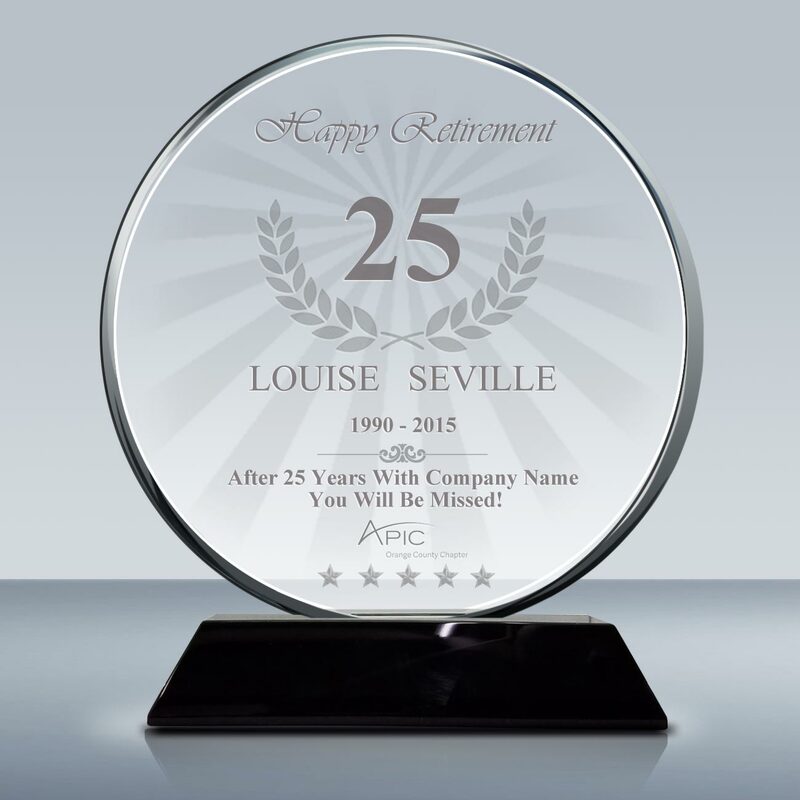 The retirement crystal plaque is inscribed with the years of service to the company or in the industry. You might also consider including any noteworthy work achievements. 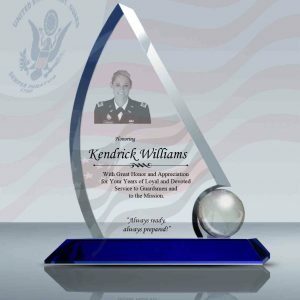 The crystal plaque is great for occasions such as Retirement Celebration, Year of service appreciation, award of service excellence and dedication; work anniversary events. 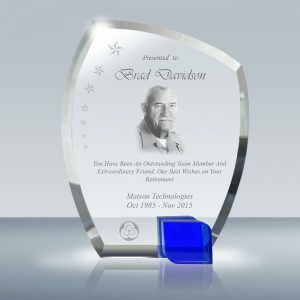 At Goodcount Awards, we offer personalized Engraved Crystal Awards, Crystal Gifts, and Crystal Plaques for Corporate Events and Personal Occasion. 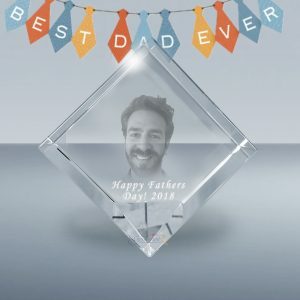 Whether you need Appreciation Gifts, Christian Gifts, Corporate Awards, Gift for First Responders including police, fire fighter, nurse, Military Gifts, Recognition Awards, Retirement Gifts, gifts for teachers and coaches, wedding and anniversary ceremonies, or more, we are here to provide them with your custom image and message. M- 5"	 L - 6"	 XL - 8"